Dr. Adekemi Oguntala has wanted to work with children from a very young age, and she has a wealth of experience working with teens and especially teen athletes. Throughout the years, Dr. Oguntala has come into contact with a wide array of issues and challenges while working with teenagers, one of which is eating disorders. If you work with teens, you know that there are many challenges that go with the job—but do you know how to deal with eating disorders? If you're a coach, you know how important it is to be present and active in your athletes' lives. However, not many coaches realize how common eating disorders are in teen athletes. Therefore, Dr. Oguntala took some time to share her extensive knowledge about eating disorders so that coaches will be more likely to notice if an athlete is having an issue. * That a teen being irritable or moody isn't necessarily just because they're "typical" teens. * Why a person suffering from an eating disorder may lose his/her hair but will most likely experience an increase in body hair. * Some of the symptoms of eating disorders that coaches, parents, and teachers should look for in teens. * Why it's important to watch teens' eating patterns. Download This FREE 39-Page Coaching Manifesto Today... And Discover How To Eliminate Your Coaching Stress... And Get More Satisfaction (And Success) With Your Team! 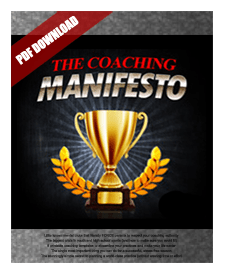 Download The FREE 39-Page Coaching Manifesto! Simply enter your name, email address and the sport you coach in the boxes below, then click on the “Access The Manifesto Now!” button.